All images copyright Calico Skies unless otherwise noted. Please link with love. Powered by Blogger. Personally, I think it's so much easier to have my accessories visible, otherwise I forget about them and then I come across a pair of earrings and I'm like, where have you been? 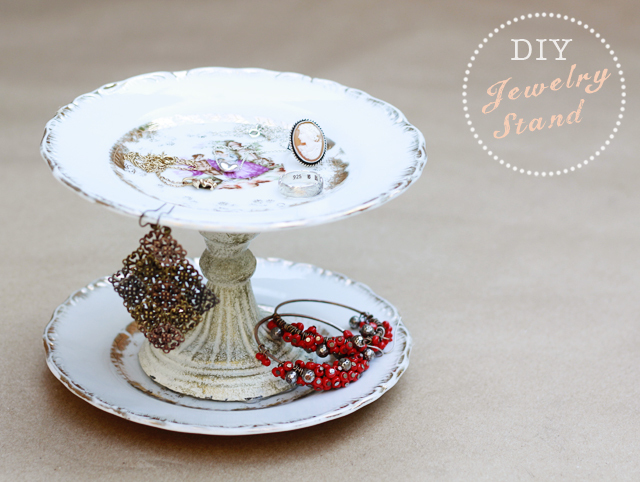 Well, here's a cute way to store and at the same time display your jewelry, using vintage pieces and materials that you may already have laying around. I found this set of four plates, I thought they were cute, plus the stamp on the bottom was so unusual (a Liger?). I had to have them. So, I used hot glue in case I ever wanted to take it apart, and add the dishes to my collection. But, you could use something stronger and more permanent like epoxy glue. This candlestick was given to by my mom, but I see them all the time at places like Pier 1 and Goodwill. 1. Choose which plate to use as your base. I realized after, that you could make the stand more tiered, by using a larger plate on the bottom so there is more space for jewelry. 2. 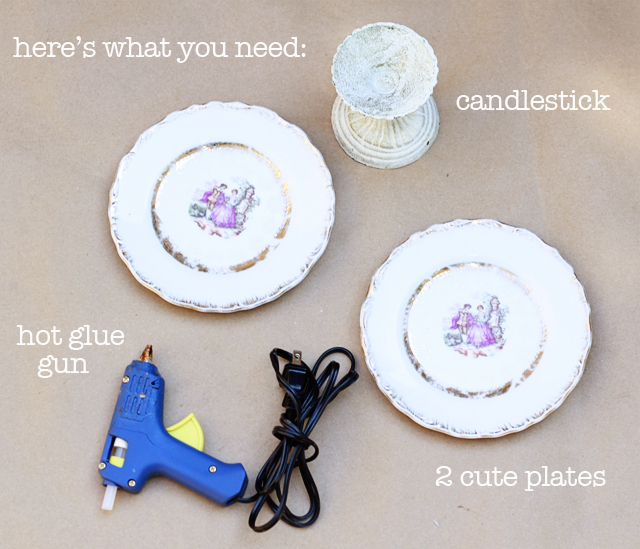 Place a thin strand of hot glue to the bottom of the candlestick. 3. 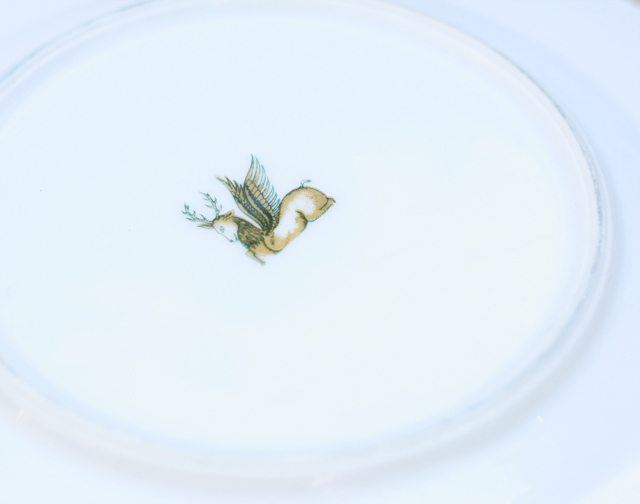 Press the candlestick on the plate firmly and allow to dry. 4. 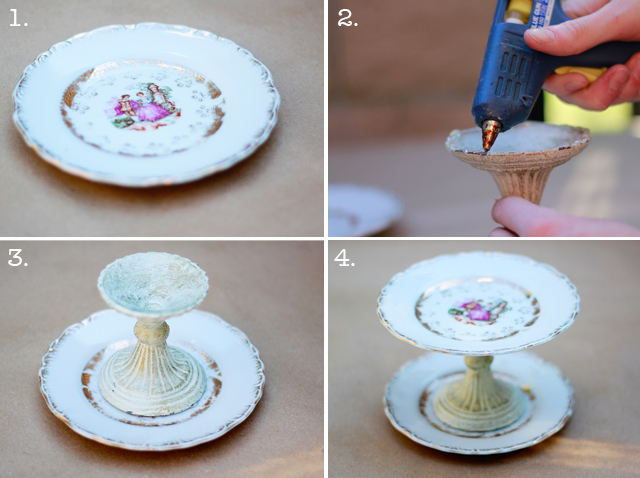 Glue the second plate to the top of the candlestick and allow to dry. Use an Exacto knife to trim any hot glue that is visible. And voila! 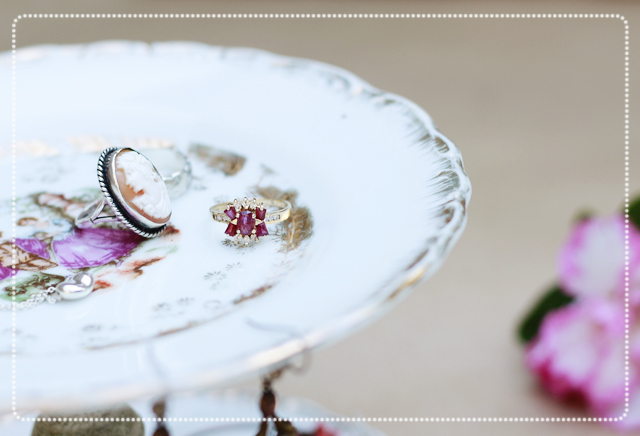 Fill your new stand with all your pretty rings, earring and necklaces. Such a cute little jewelry stand! :) I have way too much jewelry, but this would be good for the smaller pieces! I made one of these a while back and I just love it. Yours is super pretty! I love this tutorial! I've often seen vintage plates turned into dessert stands, but this would be a great idea for my dresser... one day when I get my bedroom in order. *ha ha* We can call this "motivation".??? Aw I love this! I want to make one! Thanks for sharing girl! If only I had more dresser space.. haha. Know any good DIYs on cleaning? Lovely idea. I'm gonna have to make one for myself now!